You will, no doubt, remember from my Bosna post that I appreciate Austrian food. Well, here's another Austrian-influenced "dish", perfect for using up any leftover pancakes (especially any early prototypes which may be less than perfectly formed). 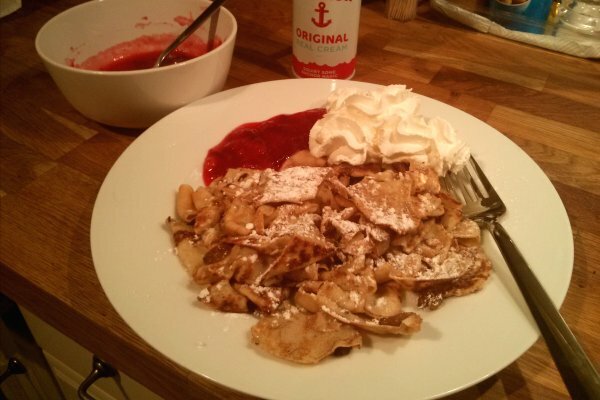 Kaiserschmarrn is an Austrian pancake dessert. If you've been skiing in Austria, you may have seen it served on the mountain - often in huge portions, sometimes easily big enough to be a whole meal in itself. I guess the real thing would be made by making a thick pancake, and then chopping it up halfway through cooking. So this is a little different, but no less tasty. 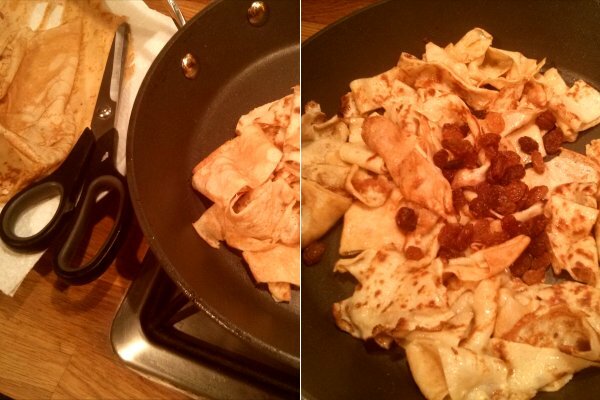 I cut my leftover pancakes into strips and re-fried them in lots of butter, along with some sultanas. They're traditionally served with a plum compote. 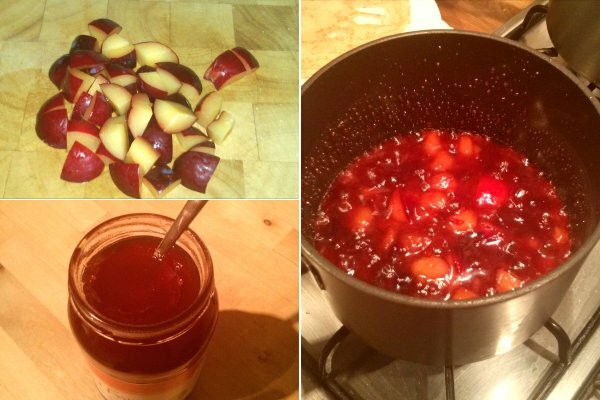 I have no idea how to make a plum compote. So I chopped up some plums and cooked them with some sugar, water, and a couple of spoons of dubious "mixed fruit" jam. The jam actually had no visible fruit in it at all - in fact it was pretty disgusting, and could best be described as a red sugary jelly. But the plums were so tart, that the combination somehow seemed to work (miraculously). Served with squirty cream, and topped with icing sugar. When did you make this?? ?